For the Portuguese rugby union player, see António Aguilar. For the Spanish radio personality, see Tony Aguilar (radio personality). Antonio Aguilar Barraza (born José Pascual Antonio Aguilar Márquez Barraza; 17 May 1919 – 19 June 2007) was a Mexican singer, actor, songwriter, equestrian, film producer, and screenwriter. He was a man standing at 6'1 with a dominating career in music. During his career, he recorded over 150 albums, which sold 25 million copies, and acted in more than 120 films. He was given the honorific nickname "El Charro de México" (Mexico's Horseman) because he is credited with popularizing the Mexican equestrian sport la charrería to international audiences. Aguilar began his career singing on the Mexican radio station XEW in 1950. That same year, he signed a contract with the Mexican independent label Musart Records and became one of its best-selling artists. He made his acting debut with Pedro Infante in the drama Un rincón cerca del cielo (1952). 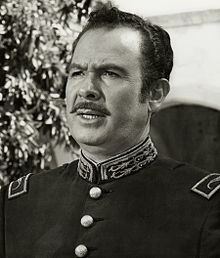 After appearing in gentleman roles in several films, he achieved popularity as a film star with his performance as lawman Mauricio Rosales in a series of seven films in the mid-1950s. His success increased with his tours throughout Latin America and his studio albums, which included Mexican folk songs (rancheras) and ballads (corridos). A corridor is not a slow romantic song ballad, as it is used in modern US to refer to slow songs of romance, but rather to a story for e.g The ballad of the Alamo by Marty Robbins. it is 2 different meanings per the dictionary )meaning 1 and 2). In the 1960s, he focused on producing and starring in films set in the Mexican Revolution. In 1970, he won Latin ACE Award for Best Actor for his portrayal of Emiliano Zapata in the 1970 epic film of the same name. He also portrayed Pancho Villa twice in film. In 1997, Aguilar was awarded the Golden Ariel for his "invaluable contribution and spreading of Mexican cinema". To this day, he has been the only Hispanic artist to sell out the Madison Square Garden of New York City for six consecutive nights in 1997. His second wife was famous singer and actress Flor Silvestre. They had two sons, Antonio Aguilar Hijo and Pepe Aguilar, who also became singers and actors. His family is known as "La Dinastía Aguilar" (The Aguilar Dynasty). Aguilar was born in Villanueva, Zacatecas, the son of Jesús Aguilar Aguilar and Ángela Márquez Barraza Valle, both of Villanueva. His parents had six other children: José Roque, Salvador (deceased), Guadalupe (deceased), Luis Tomás (deceased), Mariano (deceased) and Josefina. He spent his early childhood in La Casa Grande de Tayahua, an hacienda first built in 1596 in the town of Tayahua, about 35 km from Villanueva. Aguilar's ancestors acquired this property in the early 19th century. Aguilar began his recording career in 1950, eventually making over 150 albums and selling more than 25 million records. He was known for his corridos, with some of his best known songs including "Gabino Barrera", "Caballo prieto azabache", "Albur de amor", and "Un puño de tierra". He was the first Mexican performer to mix rodeos and concerts while touring his show in Latin America and the United States. He has been compared to American actors like Roy Rogers, Gene Autry, and Ronald Reagan. He began his acting career in 1952 during the Golden Age of Mexican cinema. In the 1950s, Aguilar was cast in aseries of films centered on rural hero "Mauricio Rosales" in El rayo justiciero (1955), La barranca de muerte (1955), La sierra del terror (1956), La huella del chacal (1956), La pantera negra (1957), La guarida del buitre (1958), and Los muertos no hablan (1958). A total of seven low-budget ranchera films produced by Rosas Films S.A. Aguilar gained cinematic notice when cast in Ismael Rodríguez's Tierra de hombres in 1956. Other collaborations with Rodríguez include La Cucaracha (1959) and Ánimas Trujano (1962), where he received starring roles. Amongst his best ranchera films are Yo... el aventurero (1959), Caballo prieto azabache (1968), El ojo de vidrio (1969), and Valente Quintero (1973). Aguilar appeared in American western films like 1969's The Undefeated starring John Wayne. He also made a memorable starring role alongside his wife Flor Silvestre in Triste recuerdo (1991). Aguilar was also largely responsible for the renewed popularity of the tambora music in the mid-1980s, when he single-handedly resuscitated the genre with the hit "Triste recuerdo". Aguilar was married to singer and actress Flor Silvestre (the stage name of Guillermina Jiménez Chabolla), and one of their children, José "Pepe" Aguilar, is among Mexico's most popular modern singers. In addition to Pepe Aguilar, he had another child with Flor Silvestre who is the eldest, Antonio Aguilar, Jr. Aguilar's grandchildren include Emiliano, Aneliz, Leonardo, Ángela, María José and Flor Susana: Emiliano, Aneliz, Leonardo, and Ángela are Pepe Aguilar's children; María José and Flor Susana are Antonio Aguilar Jr.'s. children. On 18 June 2007, doctors announced that Aguilar was no longer responding to treatment and was expected to pass away before the end of the night. On 19 June 2007, the doctor spoke out to the media that Aguilar was still alive, and his body was responding to the medication, but was still in critical condition. While there, the family received visits from many famous people including Vicente Fernández. Aguilar died on 19 June 2007 at 11:45 p.m. from pneumonia. His coffin was carried through the streets of Zacatecas, the state capital, and was honored at a memorial service attended by hundreds at a church there. His body was then taken to the hamlet of Tayahua, about 100 kilometers (62 mi) to the south, where residents waited in the streets to bid Aguilar a final farewell before he was buried at his family's "El Soyate" ranch nearby, the government news agency Notimex reported. Obituaries appeared in many newspapers, including Los Angeles Times (US), The New York Times (US), The Washington Post (US), The Guardian (UK) and The Independent (UK). News of Antonio's death were reported in newspapers of many Spanish-speaking countries, including Guatemala (El Periódico), Honduras (La Tribuna), El Salvador (El Diario de Hoy), Nicaragua (El Nuevo Diario), Costa Rica (Diario Extra), Venezuela (Correo del Caroní), Peru (Crónica Viva), Colombia (El Tiempo), Ecuador (El Diario) and Chile (El Mercurio). In 2000, for his contributions to the recording industry, Aguilar was honored with a star on the Hollywood Walk of Fame at 7056 Hollywood Boulevard. In the same year, he was the recipient of the Excellence Award at the 2000 Lo Nuestro Awards. In 2004, he was the presented with the Latin Grammy Lifetime Achievement Award. He was similarly honored with his handprints and star on the Paseo de las Luminarias in Mexico City for his work in movies and in the recording industry. "Que bonito es el amor"
"El alazán y el rocío"
"Si no me quieres, no me martirices"
"China de los ojos negros"
^ "Sepultan a Tony Aguilar en su rancho "El Soyate", en Zacatecas". Proceso. 22 June 2007. Retrieved 29 April 2017. ^ a b "Registro Civil de Villanueva: Nacimientos, matrimonios 1913-1936". FamilySearch. Retrieved 6 December 2012. ^ a b c d e "Mariachi Icon Antonio Aguilar Dies at 88". Billboard. 20 June 2007. Retrieved 31 October 2014. ^ "Antonio Aguilar - Actor: Movie (125 credits)". Internet Movie Database. Retrieved 31 October 2014. ^ Cruz Bárcenas, Arturo (28 April 2000). "Antonio Aguilar celebró 50 años de charro cantor". Jornada. Retrieved 29 April 2017. ^ a b "Internet Movie Database - Awards for Antonio Aguilar". Retrieved 7 November 2011. ^ "Una Vida de Corrido. Antonio Aguilar". Somos (195 - special issue). Mexico City: Editorial Televisa (published 1 May 2000). 2000. p. 104. ^ Ankeny, Jason. "Antonio Aguilar Biography". All Music Guide. Rovi Corporation. Retrieved 2010-01-05. ^ "Angela Barraza de Aguilar, 'United States Border Crossings from Mexico to United States, 1903-1957'". FamilySearch. This page is based on the Wikipedia article Antonio Aguilar; it is used under the Creative Commons Attribution-ShareAlike 3.0 Unported License (CC-BY-SA). You may redistribute it, verbatim or modified, providing that you comply with the terms of the CC-BY-SA.